Why is all the happenings always consentrated to the evenings and weekends? Why not start the day by doing something fun in the morning? Well ok, then there's always the fact that you have to get up in time... But say, for example at eleven or twelve? In stead you now start your morning by slowly eating breakfast and then sitting down, waiting for the inspiration to do something (read: homework) to come. And that never comes! So after a few hours of doing nothing, you have to force yourself to start working. And forcing oneself to do something is never nice. Guess where we had dinner yesterday? 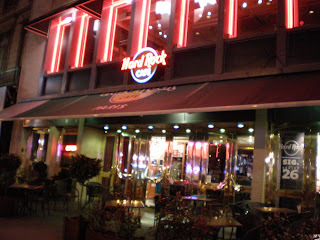 At Hard Rock Café Paris :P So now I've seen that too. It was a very nice evening indeed, with good company and good music. And the dessert was pure joy! *slurps* But I'm glad I shared it with Sophie because after the food I was already full. The portions are enormous! And hey! I'm a genious! I realised that my blanket is big enough to fold it doubled! So last night, I for the first night here in Paris slept without socks! Yay! Var "Jackson" kvar på Hard Rock Café?